Download the 100% Free LocalCooling Application and it automatically optimizes your PC's power consumption by using a more effective power save mode. You will be able to see your savings in real-time translated to more environmental terms such as how many trees and gallons of oil you have saved. * Cut your energy bills. 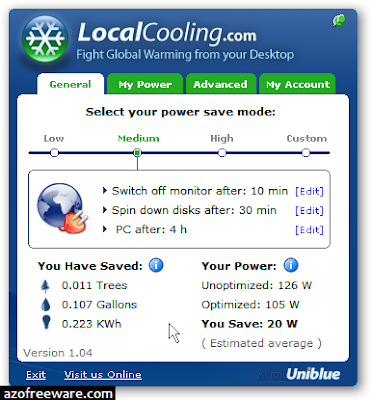 * Reduce the amount of Greenhouse Gas CO2 emissions as a result of your reduced PC power consumption. * Give you full control over your power mode settings. * Improve your overall computing experience and efficiency. * Show you in detail how much you have saved since installing the software.